Home Theater and Stereo Receivers both make great hubs for a home entertainment experience. A Home Theater Receiver (may also be referred to as an AV Receiver or Surround Sound Receiver) is optimized to be the central connection and control hub for both the audio and video needs of a home theater system. On the other hand, a Stereo Receiver is optimized to function as the control and connection hub for an audio-only listening experience. Although both have some core features in common, there are features on a home theater receiver that you will not find in a stereo receiver, and some features on a stereo receiver that you may not find on a home theater receiver. A minimum of 5 built-in audio amplifiers and a subwoofer preamp output. This enables the setup of a 5.1 channel configuration that includes a front left, center, front right, surround left, and surround right channel loudspeakers, as well as a powered subwoofer. Built-in surround sound decoding for the Dolby Digital and DTS families of surround sound formats that may be included on DVDs, Blu-ray Discs, internet streaming sources, as well as some TV programs. A built-in radio tuner (either AM/FM or FM-only). The inclusion of both analog and digital audio input options. This consists of RCA analog audio inputs, as well as digital optical and digital coaxial audio input options. HDMI connectivity - All home theater receivers now include HDMI connectivity that provides both audio and video signal pass-through for resolutions up to 1080p and an increasing number that provides 4K and HDR video pass-through as well. HDMI connections can also pass through all available surround sound formats, as well as support for Audio Return Channel. The incorporation of additional amplifiers to accommodate 7.1, 9.1, 11.1, or 13.1 channel configurations. The addition of a second subwoofer preamp output. Built-in Audio decoding for one, or more, of several immersive surround sound formats, such as Dolby Atmos, DTS:X, and Auro 3D Audio. Almost all home theater receivers provide automatic speaker setup systems, such as AccuEQ (Onkyo), Anthem Room Correction (Anthem AV), Audyssey (Denon/Marantz), MCACC (Pioneer), YPAO (Yamaha). These systems work by plugging in a provided microphone placed at the listening position and plugged into a home theater receiver. The receiver sends out test tones to each speaker which are picked up by the microphone. The speaker setup program in the receiver calculates the size of speakers and distance they are located from the listening position, then calculates the necessary crossover (the point where the lower frequencies are sent to the subwoofer and the mid and high frequencies are sent the rest of the speakers) and channel level adjustments. Multi-zone connection and control — If a home theater receiver has this capability, it can operate two or more audio or audio/video systems in other rooms via direct amplification or the use of external amplifiers. Built-in Ethernet and Wifi connectivity — This allows connection to a home network router that can facilitate connection to the internet and/or access compatible content on PCs, and other compatible devices. Internet streaming — This could include access to internet radio, and/or additional Internet-based music streaming services. Wireless Multi-room Audio - Some home theater receivers have the ability to send select audio sources to wireless speakers placed in other rooms. Examples of multi-room audio platforms include MusicCast (Yamaha), PlayFi (Anthem, Integra, Pioneer), and HEOS (Denon/Marantz). Some home theater receivers may provide for direct streaming from Bluetooth and AirPlay-enabled devices. One or two USB ports are sometimes included. This connection option allows access to music content from USB connectable devices, such as flash drives. While all home theater receivers can pass-through video signals from a connected source to a TV or video projector, many home theater receivers also provide additional video processing and upscaling capability, including video setting adjustments or calibration modes. As you can see, a home theater receiver can offer a lot of options that serve as the hub for complete audio and video entertainment experience. For examples of home theater receivers, check out ou periodically updated listing of Best Home Theater Receivers priced at $399 or less, $400 to $1,299, and $1,300 and Up. There are many cases where you might not need the capabilities of a home theater receiver, especially if you just want to listen to music. In that case, a stereo receiver may be the best option for you (and favored by many serious music listeners). A Stereo receiver typically incorporates only two built-in amplifiers, which provide a two-channel speaker configuration (left and right). In other words, no surround sound decoding or processing is provided. A Stereo receiver is only required to provide analog audio connections. Just as with home theater receivers, there are additional options that a stereo receiver may have, once again, at the manufacturer's discretion. Some of these added features are the same as those available for home theater receivers. Although stereo receivers only incorporate two amplifiers, many stereo receivers do provide what is referred to as A/B speaker connections. This allows you to connect up to 4 speakers total but does not result in a surround sound listening experience. All the "B" speakers do is mirror the main speakers and draws power from the same two amplifiers. This means that half the power is going to each speaker. The A/B speaker option is useful if you want to listen to the same audio source in a second room or provide more coverage in a large room. Zone 2 operation via preamp outputs is provided on a select number of stereo receivers but requires connection to external amplifiers. Unlike the A/B speaker configuration, if a Zone 2 option is also included, different audio sources can be sent to the main and a remote stereo system setup. There are some stereo receivers that are advertised as "4 channel receivers". However, this designation is misleading. While these receivers do have four built-in amplifiers, the third and fourth channels are mirrors of the main left and right channel amplifiers. However, this feature is practical in that you can power speakers in another location without splitting the power from the two main amplifiers, as would be the case when using an A/B switch, or having to connect an external amplifier as would be the case with a Zone 2 function. A "4 channel" stereo receiver may, or may not be able to send different sources to each set of speakers. An increasing number of Stereo Receivers provide a subwoofer preamp output. This allows the use of compact main speakers, combined with a subwoofer to reproduce the extreme low frequencies. This type of configuration is referred to as a 2.1 channel setup. Most Stereo receivers provide a headphone connection for private listening, but it is not a requirement. Although removed on many stereo receivers after CDs were introduced, the inclusion of a dedicated Phono/Turntable input connection is making a comeback on many stereo receivers, due to the revival of vinyl record playback popularity. To provide audio connection flexibility with CD players, DVD players, Blu-ray Disc players, media streamers, and cable/satellite boxes, an increasing number of stereo receivers include both digital optical and digital coaxial audio inputs. However, unlike a home theater receiver, these connections cannot access or pass Dolby Digital or DTS surround sound format signals. When included in a stereo receiver, they can only pass 2-channel PCM audio signals. Also, just as Wireless Multiroom audio is an added feature that is available on some home theater receivers, there are a limited number of stereo receivers that also provide this option. One example is the MusicCast platform available on some Yamaha Stereo Receivers. There are also some Stereo Receivers that include both Ethernet and Wifi connectivity for access to music streaming services, and/or local network device, as well as providing Bluetooth for direct music streaming from compatible smartphones and tablets. In addition, USB connectivity for flash drive stored music content may be included. Although Stereo Receivers are designed exclusively for music listening, there are some that do provide video connectivity for convenience. You may find a stereo receiver that provides analog (composite) or HDMI connectivity, although this is rare. On these stereo receivers, the video connections are provided for pass-through convenience only. A Stereo receiver does not provide any video processing or upscaling capability. Any audio passed to an HDMI-equipped stereo receiver, is limited to two-channel PCM. 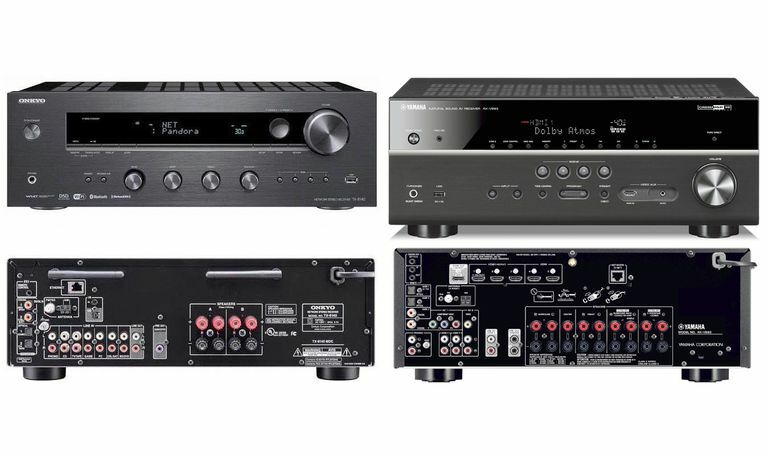 For examples of stereo receivers, check out our periodically updated listing of Best Two-Channel Stereo Receivers. Home Theater and Stereo Receivers both make great hubs for a home entertainment experience. However, they serve different roles, but that doesn't mean that you have to buy both a home theater receiver and a stereo receiver to fulfill your needs. Even though a home theater receiver is optimized for surround sound and video, they can also operate in a two-channel stereo model, which allows for traditional music-only listening. When a home theater receiver operates in a two-channel stereo mode, only the front left and right speakers (and perhaps the subwoofer) are active. If you are looking for an audio-only system setup option for serious music listening (or a hub for a second room), and have no need for all the video extras a home theater receiver might offer, a stereo receiver and good pair of loudspeakers may be just the ticket. It is important to remember that not all home theater or stereo receivers have the same combination of features. Depending on brand and model, there may be a different feature mix, so when shopping, check the feature listing of either the home theater or stereo receiver and try to get an actual listening demo, if possible, before making a final purchase decision.